This is not a financial advisory service, but much more powerful. Put simply, it is specially tailored report that illustrates what your future financial position might look like based on your current financial circumstances, life goals and needs. We are able to map out a LIFEPLAN and visually demonstrate how much you can afford to spend or invest today in order to provide for a better financial future. As a Queenslander, we have gone through GFC and flood together. Our clients start to demand much more services then before, and looking for more asset protections. 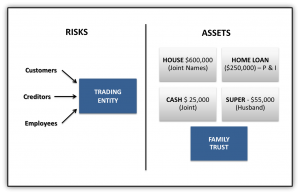 Business risks should be kept separate from business and investment assets. When running a business, you have “risks” whenever you enter into a business relationship (with customers, suppliers/creditors, and employees). In most cases, the minimum business structure required will include a trading entity and a separate asset holding entity. We call this a “level one” Structure. The asset holding entity should never have business “relationships” – it should only invest or loan funds to related entities. To make sure we understand our clients’ needs, we send out yearly Personal and Business Needs Review form. It will provide a other channel of communication. The main purpose of business pre-sale preparation is to structure the selling company and to eliminate the risk factors obstructing the selling process for the potential investor. For the business buyer pre-sale preparation is the signal of buyer’s gravity expectancies. The buyer is ready to pay higher price for transparent and structured business. Leader Accountancy is sending monthly business update e-mails and special e-mail Bulletins. List of pass issues are here.